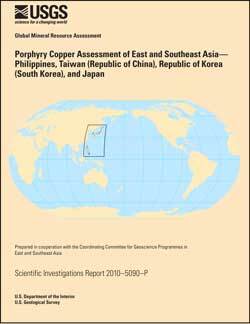 The U.S. Geological Survey collaborated with member countries of the Coordinating Committee for Geoscience Programmes in East and Southeast Asia (CCOP) on an assessment of the porphyry copper resources of East and Southeast Asia as part of a global mineral resource assessment. The assessment covers the Philippines in Southeast Asia, and the Republic of Korea (South Korea), Taiwan (Province of China), and Japan in East Asia. The Philippines host world class porphyry copper deposits, such as the Tampakan and Atlas deposits. No porphyry copper deposits have been discovered in the Republic of Korea (South Korea), Taiwan (Province of China), or Japan. Thirteen geographic areas were delineated as tracts that are permissive for porphyry copper deposits in the assessed area. Individual tracts range from about 3,000 to 100,000 square kilometers in area. Permissive tracts are delineated on the basis of mapped distributions of igneous rocks of specific age ranges that define subduction-related magmatic arcs or magmatic belts that might contain porphyry copper deposits. Most of these magmatic arcs are subduction related, although some porphyry deposits and prospects are present in back-arc or poorly understood tectonic settings. Maps at various scales were used in the compilation; however, the final tract boundaries are intended for use at a scale of 1:1,000,000. Numbers of undiscovered deposits were estimated at different levels of confidence for 10 permissive tracts in the Philippines including one area that extends to eastern Taiwan (Republic of China); permissive tracts in South Korea and Japan are discussed qualitatively. Estimates of numbers of undiscovered deposits were combined with grade and tonnage models using Monte Carlo simulation to estimate amounts of undiscovered resources. Grades and tonnages of known porphyry copper deposits in the study area were compared with global grade and tonnage models to determine the appropriate model for simulation of undiscovered resources. Most of the known deposits are best described as copper-gold subtypes of porphyry copper deposits. For some permissive tracts, a general porphyry copper-gold-molybdenum model was used. Thirty-eight porphyry copper deposits are known in the Philippines; the mean number of undiscovered deposits was estimated to be 28. Mean (arithmetic) resources that could be associated with the undiscovered deposits are 90 million metric tons of copper and 5,800 metric tons of gold, as well as byproduct molybdenum and silver. Additional resources that could be discovered in extensions to known deposits were not evaluated. Assessment results, presented in tables and graphs, indicate expected amounts of total contained metal and mineralized rock in undiscovered deposits at different quantile levels, as well as the arithmetic mean for each tract. The Philippines have a long history of porphyry exploration cycles and mine development, interrupted at times by political and social unrest, environmental concerns, and natural disasters. Changes in mining laws within the region and the recent high price of gold on the world market have prompted renewed interest in porphyry copper deposits in the region. South Korea and Japan have been thoroughly explored for many types of mineral deposits. Available data suggest that the permissive rocks in South Korea typically are too deeply eroded to preserve porphyry copper deposits. Porphyry copper systems may be present in Japan, but are likely to lie at depths greater than the 1 kilometer from the surface protocol adopted for this study. Descriptions of the geologic basis for delineating each tract, the data used, the geologic criteria and rationale for the assessment, and results of the assessment are included in appendixes along with the description of a geographic information system (GIS) that includes tract boundaries, known porphyry copper deposits and significant prospects, and assessment results.